So now you have the basic knowledge of HVAC systems and how to care for them – what do you do when the problem is beyond your knowledge and skill? This is where an HVAC contractor comes in. How do you find one, how do you know who to trust? 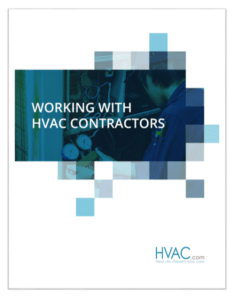 Working with HVAC contractors can be intimidating if you aren’t familiar, but a contractor is your best ally when it comes to keeping your heating, cooling, and indoor air quality systems operating effectively and efficiently. In the guide to the left, we’ll discuss how to find contractors and what to look for as you search for the right HVAC contractor to partner with. When dealing with an issue regarding your HVAC needs, you don’t want to struggle finding good, qualified help. You should know right off the bat that you are getting help from a contractor that is knowledgeable in the industry and skilled to handle whatever task is put before them. Complete this form and download this handy HVAC repair guide!